More than 14 years ago, America suffered the most devastating attack on its homeland. Once the debris and dust settled from the collapse of the twin towers, it became clear America had to respond. Addressing Congress and the nation a week later, Bush said, “Whether we bring our enemies to justice or bring justice to our enemies, justice will be done.” While the president was making the case for action in the face of 9/11, at Whiteman Air Force Base in Missouri, the home of the B-2 stealth bomber, crews were already preparing for whatever military action the president ordered. Whiteman sits about an hour east of Kansas City in the one-stoplight town of Knob Noster, Missouri. Since 1993, it has been the permanent home for America’s entire fleet of B-2 Spirit bombers. Although the initial plans were to create a fleet of 132 bombers, the end of the Cold War reduced that purchase to just 21 aircraft. Although each bomber has a tail number, it also has a moniker. The first 20 B-2s were named after a state in the union. The first B-2 named was the Spirit of Missouri, recognizing the home of America’s most advanced aircraft. The second B-2 was named the Spirit of California for the state where most of the assembly and testing of the aircraft had been performed. The last B-2 entered operation in 2000 and was simply named the Spirit of America. One only has to look at the aircraft to realize its unique design. Not only does it resemble Jack Northrop’s concept of the flying wing, but it houses three computers working in parallel to operate its highly complex fly-by-wire design. While the B-52 and B-1 bombers have crews of five and four people respectively, the B-2’s digital cockpit design and redundant navigation system reduced the crew to just two people. Furthermore, the B-2 was the only aircraft initially capable of delivering the Joint Direct Attack Munition (JDAM) when it made its combat debut in 1999 over the skies of Yugoslavia during Operation Allied Force. Two years later, the B-2 would again lead the fight in a different part of the world. On the morning of 9/11, a majority of the operational B-2 fleet was taking part in a Strategic Command exercise that had aircrews sitting in their jets monitoring radios. Just when the crews expected a transmission terminating the exercise, the opposite happened. Aircrews were ordered to assume a higher state of readiness and remain at their jets. Word spread throughout the fleet that a jet had hit one of the World Trade Center towers. With news of the second plane hitting the other tower, the entire force knew the implication. This was no accident. America was under attack. For the next two days, B-2 crews would remain with their jets ready to respond. The exercise eventually ended, but the preparations did not. The 509th Bomb Wing identified six crews that would fly the initial B-2 missions, if called upon. For the next three weeks, these crews flew simulators and actual flights practicing their procedures and coordination. During his speech to Congress, Bush said, “The Taliban must act and act immediately. They will hand over the terrorists, or they will share in their fate.” Holding true to his warning, operations over Afghanistan began on October 7, 2001, less than a month after 9/11. I came to the B-2 program in 1998 having previously flown the B-52 bomber for nine years. Upon completing B-2 initial qualification training in 1999, I served as a B-2 wing weapons officer, B-2 instructor pilot, and then assistant director of operations in the 393rd Bomb Squadron. The other pilot on the mission, Brian “Jethro” Neal, came to the B-2 program having flown a tour in the F-16 Falcon at Hill Air Force Base. We both came to the base on October 6, 2001, expecting our normal routine. We would review the mission, conduct simulator training, debrief, go home and return the next day. That night was different. As we arrived, the word was the first B-2s were to launch. Brian and I manned the spare aircraft the first night, meaning that if one of the first two aircraft broke, we would have an aircraft ready to go. When the first two aircraft got airborne, we shut down ours and went home. About four hours into the mission, we approached the California coast for our first air refueling. For operations security reasons, the decision was made to fly the B-2s across the Pacific Ocean to their ultimate targets in Afghanistan. The sun was just starting to rise on the east coast as we approached the KC-135 refueling aircraft. We topped off our tanks and settled in for the next leg of our mission, which was the four-hour flight to Hawaii for our next air refueling. 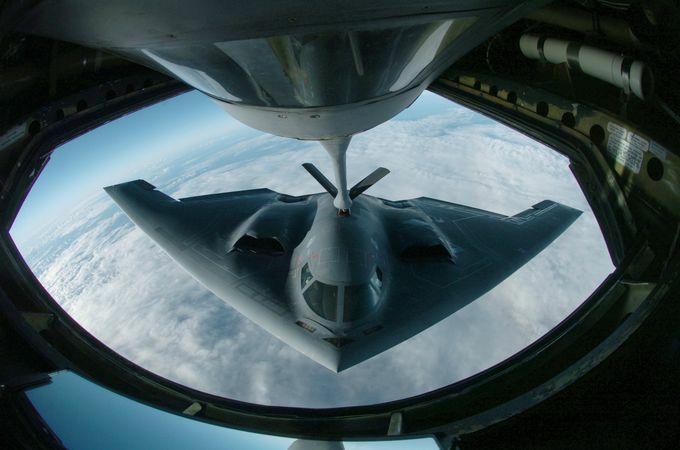 While the B-2 is a two-person aircraft, operating rules say two people only have to be in the seats during critical phases of flight: takeoff, air refueling, landing and, of course, bombing. Between refuelings, Brian and I took turns trying to get a few hours of rest in the modified “cot” behind the two ejection seats. The pattern of meeting a much-needed gas station in the air happened at least three more times en route to Afghanistan. Our formation met tankers over Guam, through the Straits of Malacca and in the Indian Ocean, close to Diego Garcia. The voyage across the Pacific Ocean took more than 24 hours. Since the sun was coming up in the east as we started our voyage west, we traveled in daylight throughout our trek across the Pacific. The air refueling over the Indian Ocean was the last before we reached Afghanistan. We turned north and headed up the coast of India to our destination. By the time we approached the Pakistani coast, two things happened. First, the sunlight that had accompanied us the entire journey slowly went away. In order to fight off the release of melatonin that comes at that moment, the flight doctor had given each crew member an approved “pick me up pill” to make sure everyone was alert going into combat. Second, 70 percent of the targets we stepped out the door with back in Missouri had changed. This meant reprogramming the targets for a majority of the 16 JDAMs that filled the two bomb bays on the B-2. That night, we conducted bombing runs on multiple targets throughout Afghanistan with the primary mission being to secure air superiority for air forces that would conduct subsequent attacks. During some bomb runs, we used the B-2’s onboard synthetic aperture radar to put eyes on target in order to refine target coordinates before releasing our JDAMs. After spending about two hours over enemy territory, we exited the country and headed for the last tanker that would give us the gas for our last leg of the journey. A radio call came over secure communications that the Air Operations Center wanted to know if we would be willing to head back into country since we had four JDAMs remaining. We accepted the mission. With gas running low, we orbited in the Arabian Sea waiting for a tanker that would give us the fuel necessary for another trip into Afghanistan. While Brian got the fuel, I programmed the mission. With fuel onboard and a mission loaded, we commenced another journey into Afghanistan to strike the identified target. After 90 minutes, we exited Afghanistan a second time to find a waiting tanker to provide the fuel we needed reach Diego Garcia, our final destination. Four hours later, we were approaching the u-shaped island, ready to touch land for the first time in 44 hours. The B-52 that landed immediately before us had an emergency upon landing forcing us to “go around.” After having been airborne for 44 hours, we enjoyed the 15-minute flight over the island. We touched down after being 44.3 hours in the air. For Brian and I, the mission was over, but not for the Spirit of America. While we unloaded our gear, maintenance troops put oil into the running engines of the B-2. A fresh crew of two B-2 pilots got on board and within 45 minutes the stealth bomber was airborne for its 30-hour journey back to Missouri. While we flew more than 44 hours on our mission, the Spirit of America and five other B-2s operated for more than 70 hours without stopping. Not one aircraft broke or encountered engine trouble during the first three days. It is a true testament to the incredible engineering and design of the aircraft. Earlier this year, I retired from the Air Force as a colonel. Brian, now a colonel (select), transitioned to the reserves, where he flies the Air Force’s most advanced aircraft—the F-22 Raptor. More importantly, the Spirit of America continues to serve the country from its home in Knob Noster, Missouri, and will do so long after Brian and me. Of all the aircraft that could have flown the longest combat mission in aviation history, perhaps it was serendipity or providence that it was the Spirit of America that made that journey. The aircraft that represented the country showed that America will fly any distance, cover any ground and overcome any obstacle to bring justice to its enemies when she is attacked.